Background Caudal analgesia is the most common method used in the subumbilical region in pediatrics. The inguinal field block and the ultrasound-guided transversus abdominis plane block are other modalities to control postoperative pain in inguinal hernial repair in pediatrics. 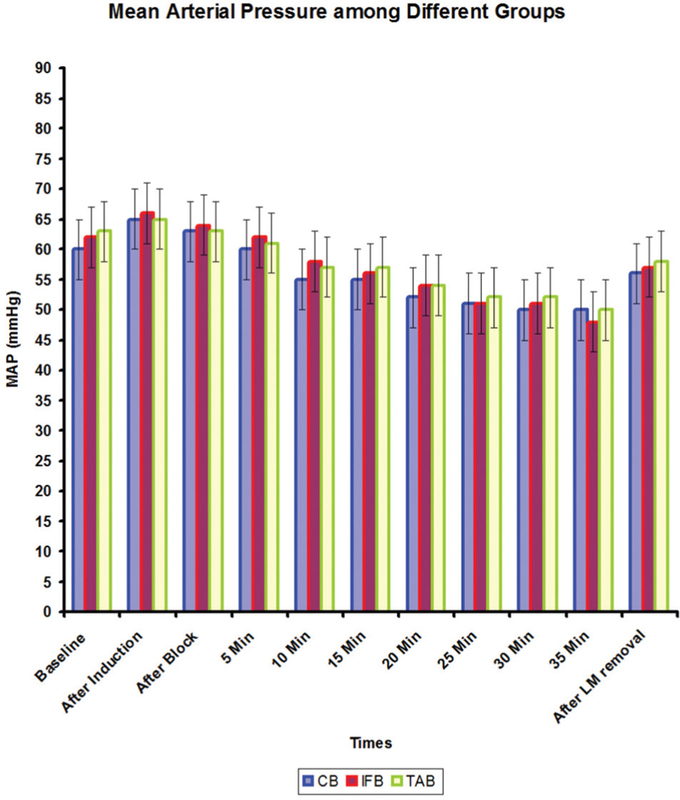 The aim of this study is to compare the combination of general anesthesia and these techniques on postoperative pain score, first time to rescue analgesia, intraoperative hemodynamics, and postoperative sedation. Methods In all, 120 pediatric patients (3–10 years old) scheduled for inguinal hernia repair under general anesthesia were allocated into three groups: Group I [caudal block (CB)]: in this group, the patients received 0.5 ml/kg of bupivacaine 0.25% caudally. Group II [inguinal field block (IFB)]: received 0.5 ml/kg of bupivacaine 0.25% under ultrasound guidance. Group III [transversus abdominis plane block (TAP)]: received 0.5 ml/kg of bupivacaine 0.25% under ultrasound guidance. The measurement: intraoperative (heart rate and mean arterial blood pressure), modified objective pain score, first time to rescue analgesia, Ramsay sedation score, and postoperative adverse effects. Results The time to first rescue analgesia and the modified objective pain was less with more sedation in IFB and TAP groups compared with the CB group from after 6 till 18 h. Also, the IFB is superior to TAP in pain control at 24 h and in prolongation of the time of analgesia. Conclusion The three techniques are safe and provide good intraoperative hemodynamic stability. Both IFB and TAP provide less pain score and prolonged postoperative analgesia and also more sedation than CB after 6 till 18 h.
The inguinal hernia in pediatrics is a common problem that requires surgical interference to avoid incarceration. It represents about 3–5% in full-term infants . Preemptive analgesia using local anesthetics in pediatrics is a good idea after surgical operation. Regional anesthesia is the most frequent method used for relief of postoperative pain in pediatrics as it is reliable and safe ,. Caudal analgesia is the most common method used in the subumbilical region in pediatrics. It provides good analgesia during and after surgery . Another modality to control pain after hernial repair in pediatrics is the inguinal field block under ultrasound guidance (ilioinguinal and iliohypogastric nerve blocks) ,,. Lateral transversus abdominis plane block (TAP) with ultrasound guidance using local anesthetics placed in a plane between internal oblique muscle and transversus abdominis muscle to block innervations of the anterior abdominal wall. It is used for lower abdominal surgeries in newborn and infants . This study aimed to compare the combination of general anesthesia with caudal block (CB) or inguinal nerve block or TAP on postoperative pain score and first time to ask for analgesia as the primary outcome. The secondary outcome includes (intraoperative hemodynamic changes, postoperative sedation, and postoperative adverse effects). This study was conducted from December 2015 to December 2016 after the approval of the local Clinical Research Ethics Committee of Menoufia Hospital. Written informed consents were obtained from the parents of patients before the operation. One hundred and twenty children with the American Society of Anesthesiologists (ASA) physical status classes I and II, aged 3–10 years scheduled for elective inguinal hernia repair were included in this study. Preoperative examination and evaluation were done. Patients with cardiovascular diseases, clotting disorders, and local anesthetics allergy or patient’s refusal to informed consent were excluded from the study. All patients were premedicated with 0.5 ml/kg oral diazepam 60 min before transfer to the operating theater. On arrival to the operating room, the patient was attached to routine monitors including pulse oximetry, noninvasive blood pressure, and ECG. 22-G cannula was inserted into a peripheral vein. The induction of general anesthesia was conducted by sevoflurane 8% through a face mask and propofol 2 mg/kg and the airway was secured with a properly sized laryngeal mask. The anesthesia was maintained with spontaneous inhalation of sevoflurane. Then the patients were enrolled randomly by a sealed envelope into 30 groups (40 patients for each). Group I CB: in this group, the patient was turned to lateral position and under complete aseptic condition, the sacral hiatus was palpated and by the loss of resistance technique. The correct position of the needle was tested by injection of 3 ml of saline, if no swelling occurred, it is in the correct site but if the swelling was palpated the needle was redirected. The dose injected was 0.5 ml/kg of bupivacaine 0.25%. Group II IFB: in this group, the broadband linear array ultrasound probe (sonoscape portable ultrasound machine, model A5 with a high frequency (7.5–12 MHz) was put in the midaxillary line just above the iliac crest and with slight movement of the probe toward the anterior superior iliac spine. So, the three muscles appeared (transversus abdominis is the deepest, internal oblique is the most thickened, and the external oblique). Two rounded structures appeared between the transversus abdominis and the internal oblique which are the ilioinguinal and iliohypogastric nerves. Then the spinal needle 22 G was put parallel to the probe and then after carful aspiration it was advanced obliquely and then an injection of 0.5 ml/kg of bupivacaine 0.25% was administered. Group III TAP: in this group, a broadband linear array ultrasound probe (sonoscape portable ultrasound machine, model A5 with high frequency (7.5–12 MHz) was put in the midaxillary line between the iliac crest and the costal margin and then a spinal needle 22 G was inserted just lateral to the probe and advanced medially to penetrate the fascia of the internal oblique muscle and then 5 ml of saline was injected to open the plane by the ultrasound-guided technique. The local anesthetic was injected between the transversus abdominis and the internal oblique fascia. The dose injected was 0.5 ml/kg of bupivacaine 0.25%. The different types of blocks were done by the same expert anesthesiologist, after 10 min from the injection of the local anesthetic, the operative steps were started, and the block considered failed if the heart rate (HR) or the mean arterial blood pressure (MAP) increased by 20%. In this time, the patient was excluded from the study and fentanyl (1 µg/kg) was given as another way for analgesia. The anesthesia was maintained by O2 in air with sevoflurane till the completion of surgery. And then sevoflurane was disconnected and the laryngeal mask removed and the patient was transferred to postoperative anesthesia care unit (PACU) and to the ward. The demographic data (age, weight, ASA status, and duration of surgery) were recorded. The effectiveness of the technique was evaluated by the number of failed cases after the block. Intraoperative HR and MAP before induction, after induction, after block, and every 5 min till transfer of patient to the PACU. 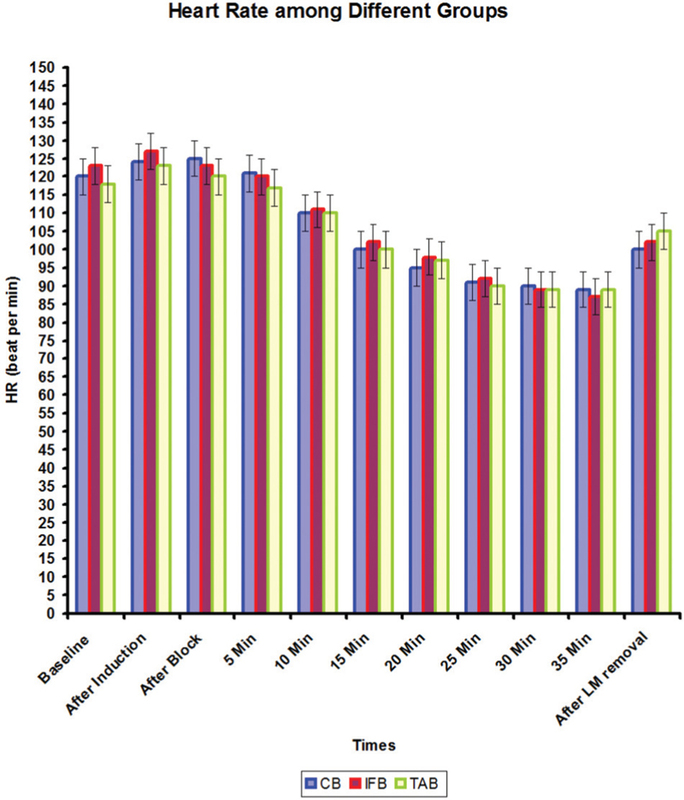 The modified objective pain score (MOPS) (as shown in [Table 1]) was used to assess the pain intensity at PACU and in the ward in the following times: 30 min, 1, 2, 3, 6, 12, 18, and 24 h .
Supplementary paracetamol intravenous was available if the MOPS of at least 4. The dose of intravenous paracetamol is 15 mg/kg to relief pain. The first time to require paracetamol injection was calculated (the time from performing the block for the first time to requiring analgesia), also the number of patients requiring analgesia in the first 24 h postoperatively and how many times the patient need paracetamol injection in the 24 h were calculated. Ramsay sedation score as shown in [Table 2] was also assessed at the same time as that of the pain score. The adverse effects of the blocks such as vomiting, urinary retention, and motor affection were assessed. A power analysis and sample-size estimate were made based on previously published data as regarding the primary outcome (pain score) in the CB and TAP block in the lower abdominal surgery in pediatrics. The number of sample size was enough (120 patients) with α=0.05 and a power of 0.8. Statistical analysis of data was carried out in the comparisons; P value of less than 0.05 were considered significant. The program of statistical analysis used in our study is Minitab version 1.6 program. For analysis of the numerical data, analysis of variance test was used as data expressed in mean and standard deviation (age, duration of surgery, duration of analgesia, MAP, HR, and for categorical values χ2-test were used as data expressed in number or ratio (ASA classification, number of patients requiring analgesia and the number of times the patient required paracetamol injection in 24 h and side effects). For nonparametric values, Kruskal–Wallis test was used for postoperative pain and sedation score as data expressed as median and range. One hundred and twenty pediatric patients were included in the study; nine of them were excluded because of failed regional blocks (two in group C, three in the IFB group and four in the TAP group. This showed that the CB was easier than the other two groups, but with no significant difference between the three groups. The demographic data were comparable in the three groups as shown in [Table 3]. There was no statistical significance of HR changes among the studied groups at all times during surgery as shown in [Figure 1]. Figure 1 Heart rate changes among the studied groups; data expressed by mean and SD. There was no statistical significance of mean arterial blood pressure changes among the studied groups at the all times during surgery as shown in [Figure 2]. Figure 2 Mean arterial blood pressure changes among the studied groups; data expressed by mean and SD. MOPS as shown in [Table 4]: there was insignificant variation among the studied group in the first 6 h. Both IFB and TAP groups showed a significant decrease in the pain score at 12 and 18 and 24 h in comparison to the CB group. But also the pain score was significantly decreased in the 24 h in the IFB group in comparison to the TAP group. [Table 5] shows that sedation score was comparable at all times except that at 12 and 18 the sedation score was significantly increased in both IFB and TAP groups in comparison to the CB group. [Table 6] shows that the first time to rescue analgesia and the number of times of analgesia required per patient in first 24 h were significantly prolonged in both IFB and TAP groups in comparison to the CB group. However, the IFB group shows a significant prolongation of the first time asking for analgesia in comparison to the TAP group (370.4 and 360.7 min, respectively). [Table 7] shows that vomiting and motor affection were comparable in all groups. However, urinary retention was significantly increased in the TAP group in comparison to the other two groups. The combination of regional techniques (CD and nerve blocks) and general anesthesia in lower abdominal surgeries in pediatrics provides a good method for pain relief after surgery; it also decreases complications . This study compared some of the different modalities of regional blocks (CD, an inguinal field block, and transversus abdominis plane block) combined to general anesthesia to control pain after inguinal hernia repair in pediatrics. As regards the demographic data in the study, there were no significant differences among the groups. There was insignificant difference among the studied groups as regards intraoperative hemodynamics (HR and MAP). In the study done by El Fawy and El Gendy  which compared the TAP block versus caudal analgesia in pediatric patients who underwent pyeloplasty found that HR and MAP were comparable in both intraoperative and postoperative. Also, Markham in his study comparing the ilioinguinal block versus CD in lower abdominal and penile surgeries found that HR&MAP were comparable in both intraoperative and postoperative . Also, the study of Sethi et al. who compared CD and tap block in lower abdominal surgeries in infants concluded that intraoperative hemodynamics was comparable in both groups. As regards pain score, first time of an analgesia and the number of times of analgesia required per patient in the first 24 h: in the first 6 h, the results were comparable among the studied groups. But at 12 and 18 h, the pain score and prolongation of analgesia were significantly enhanced in both IFB and TAP groups when compared with the CB group. On other hand, at 24 h the pain score and prolongation of analgesia were significantly enhanced in IFB only in comparison to the other two groups. Also, the number of times of analgesia required per patient in the first 24 h was significantly decreased in both IFB and TAP groups (2.5 times/patient and 2.6 times/patient, respectively) compared with the CB group (3.1 times/patient). A study performed by Bryskin et al. who compared the TAP block versus CD in lower abdominal surgeries in children concluded that there was no difference in the total amount of morphine required in the first 12 h in both groups, but at 24 h the total morphine consumption was significantly decreased in the TAP group with less vomiting (as a side effect of morphine). The study done by Elsadek et al. who compared TAP and the CD in lower abdominal surgeries in infants concluded that the pain score and consumption of analgesia from 6 to12 h was significantly decreased in the TAP block group. Camey et al. in his study on children under 16 years of age undergoing open appendicectomy showed that unilateral TAP block provided better analgesia in the form of reduced dose of morphine consumption in the first-day postoperatively. Also, the study by Neha and Sharmila , which compared the TAP block versus the caudal analgesia in pediatric patients who underwent lower abdominal surgeries concluded that the TAP block was superior to CB in the postoperative analgesia period during the duration of their study. But on another study of El-Bahrawy and El-Deeb  which compared TAP block versus CD in 1-day surgery in unilateral abdominal surgeries in pediatric patients concluded that the pain score was comparable at all times until 24 h. This difference can be explained by that in their study the children fulfill the criteria to leave the hospital in six hours as the surgery is 1-day surgery, so the pain score after that was assessed by the parents. In the study done by Abdellatif  on iliohypogastric and ilioinguinal nerve blocks were superior to the CD in decreasing the pain score and also it prolongs the duration of analgesia on infants who underwent unilateral groin surgery. In a study by Mohamed and Kamal , comparing the iliohypogastric and ilioinguinal nerve blocks and TAP block on postoperative pain relief after inguinal hernial repair in pediatric patients concluded that the ilioinguinal and iliohypogastric nerve blocks were less in pain score and more in prolongation of the first time to require analgesia. In the view of sedation score, in the first 6 h and at 24 h, the results were comparable in the three groups, but there was a significant increase in the 12 and 18 h in IFG and TAP groups in the sedation score compared with the CB group. In agreement with our result, Mc Donnell et al. in their study on the effect of TAP block in the postoperative sedation of cesarean section showed that the incidence of sedation was reduced in patients undergoing TAP blockade. The study by Bryskin et al. who compared the TAP block versus CD in lower abdominal surgeries in children concluded that emesis increased significantly in CD. This difference is due to the use of morphine by Bryskin et al. as a postoperative pain relief, in contrast to our study which used paracetamol. Both inguinal nerve block and transversus abdominis plane block provide less pain score and prolonged postoperative analgesia and also more sedation than the CD after 6 till 18 h after unilateral inguinal hernia repair in pediatric patients. Also, the inguinal nerve block is superior to transversus abdominis plane block in pain control at 24 h and in prolongation of the time of analgesia. Also, the three techniques are safe and give good intraoperative hemodynamic stability. Zamakhshary M, To T, Guan J, Langer JC. Risk of incarceration of an inguinal hernia among infants and young children awaiting elective surgery. CMAJ 2008; 179:1001–1005. Lao OB, Fitzgibbons RJ, Cusick RA. Pediatric inguinal hernias, hydroceles, and undescended testicles. Surg Clin North Am 2012; 92:487. Jöhr M. Regional anesthesia in neonates, infants, and children. Eur J Anaesthesiol 2015; 32:289–297. Johr M, Berger TM. Caudal blocks. Paediatr Anaesth 2012; 22:44–50. Eichenberger U, Greher M, Kirchmair U, Curatolo M, Moriggl B. Ultrasound-guided blocks of the ilioinguinal and iliohypogastric nerve: accuracy of a selective new technique confirmed by anatomical dissection. Br J Anesth 2006; 97:238–243. Cousins MJ, Mather LE. Intrathecal and epidural administration of opioids. Anesthesiology 1984; 61:276–310. Shukla U, Prabhakar T, Malhotra K. Postoperative analgesia in children when using clonidine or fentanyl with ropivacaine given caudally. J Anaesthesiol Clin Pharmacol 2011; 27:205–210. Suresh S, Chan VW. Ultrasound guided transversus abdominis plane block in infants, children, and adolescents: a simple procedural guidance for their performance. Paediatr Anaesth 2009; 19:296–299. Wilson GAM, Doyle E. Validation of three pediatric pain scores for use by parents. Anaesthesia 1996; 51:1005–1007. Ramsay MA, Savage TM, Simpson BR. Controlled sedation with alphaxalone-alphadolone. BMJ 1974; 2:656–659. Jankonic Z. Transversus abdominis plane block: the holy grail of anesthesia for (lower) abdominal surgery. Periodicum Biologorum 2009; 3:203–208. El Fawy DM, El Gendy AA. Ultrasound-guided transversus abdominis plane block versus caudal block for postoperative pain relief in infants and children undergoing surgical pyeloplasty. Ain Shams J Anaes 2014; 7:177–181. Markham S, Tomlinson J, Hain WR. Ilioinguinal nerve block in children: a comparison with a caudal block for intra and postoperative analgesia. Anaesthesia 1986; 41:1098–1103. Sethi N, Pant D, Dutta A, Koul A, Sood J, Chugh PT. Comparison of the caudal epidural block and ultrasonography-guided transversus abdominis plane block for pain relief in children undergoing lower abdominal surgery. J Clin Anesth 2016; 33:322–329. Bryskin RB, Londergan B, Wheatley R, Heng R, Lewis M, Barraza M et al. Transversus abdominis plane block versus caudal epidural for lower abdominal surgery in children: a double-blinded randomized controlled trial. Anesth Analg 2015; 121:471–478. Alsadek WM, Al-Gohari MM, Elsonbaty MI, Nassar HM, Alkonaiesy RM. Ultrasound guided TAP block versus ultrasound-guided caudal block for pain relief in children undergoing lower abdominal surgeries. Egypt J Anaesth 2015; 31:155–160. Carney J, Finnerty O, Rauf J. Ipsilateral plane block provides effective analgesia for the appendectomy in children. A randomized controlled trial. Anesth Analg 2010; 111:4998–1003. Neha K, Sharmila A. Comparison of transversus abdominis plane block and caudal block for postoperative analgesia in children undergoing lower abdominal surgery. Int J Sci Res 2013; 6:2319–7064. El-Bahrawy K, El-Deeb A. Transversus abdominis plane block versus caudal block for postoperative pain control after day-case unilateral lower abdominal surgeries in children: a prospective, randomized study. Egypt J Anaesth 2016; 3:20–24. Abdellatif AA. Ultrasound-guided ilioinguinal/iliohypogastric nerve blocks versus caudal block for postoperative analgesia in children undergoing unilateral groin surgery. Saudi J Anaesth 2012; 6:367–372. Mohamed HM, Kamal MM. Comparison of postoperative analgesia of ultrasound-guided ilioinguinal/iliohypogastric nerve block versus ultrasound-guided TAP block for pediatric inguinal hernia repair. Ain Shams J Anaes 2015; 8:658–663.